Then this will be the most important letter you'll ever read. For the last four years in a row, twice a year a group of 150 lucky people go on a life-changing bus trip... and it happens right here In Brisbane. But this trip is not like any other trip. Each and every one of the hundred and fifty people on those busses is either a successful property investor already, or will become one over the months following this trip. into a profitable property investor in just months? Well, this trip is no ordinary trip. It is, quite simply and by far, the best educational event any property investor in Queensland could ever attend (if not the best for anyone in the entire country). And let me tell you why. We have absolutely NO property to promote to you. We have NO development projects to sell you on. Our only agenda, which we are very open about, is giving you the tools and knowledge that you desperately need in order to make a good living with real estate these days. PLEASE, do not bother reading any further unless you are dead-serious about becoming a property investing success story. There's only room on this trip for people who are committed to getting out of the rat race and finally making it. There are no loser, prehistoric, boring, "BUY, HOLD & PRAY" deals on this bus trip! Sorry, but we're just not interested in teaching any strategy where you lose money daily via negative gearing while awaiting capital growth. The only strategies you WILL learn on this trip are current strategies... used in live deals right now... in the current market... and run by real, everyday people like you and me. You will not only hear about these strategies and learn how to apply them to the current market, but you'll also get to inspect live deals in detail. You'll meet with the investors and get to grill them and extract any insider information that interests you - from the exact numbers behind the deal, to lessons learned, and even hear about the costly mistakes made, so you don't have to repeat those mistakes in your investing! But what kind of deals and strategies are you going to see, you ask? In fact, a large portion of this experience will be dedicated to teaching you how to find opportunities and great deals everywhere... including... even cashflow positive properties within 15km of CBD, OMG! if you know where & how to look! A new way you may have not seen before to do profitable cosmetic renovations... so easy, practically anyone can do it! You won't find this kind of current information anywhere else. And by the time you find it elsewhere - it would already be outdated. The most fun and info-packed property investing day you'll ever experience! We will meet at the Colmslie Hotel, Corner Wynnum & Junction Roads Morningside, Brisbane for an 8am registration. The trip will start at 8.30am and we will return to our original destination by 6pm. You will be able to buy meals from a shopping centre / bistro nearby. Tea/coffee/water will be provided. There IS some bad news. The last time we offered this bus trip - it was about six months ago - all tickets sold out in less than 48 hours. And this time around there are even fewer seats on the bus, for reasons I'll perhaps share another time. What this means is this. Not only will tickets most definitely sell out this time around, but they'll sell out FASTER. So if meeting and networking with like-minded people is your cup of tea... if learning the most cutting edge property investing strategies and systems for the current market excites you... if you want to learn what it takes to really have success with real estate in Brisbane and the rest of QLD in 2016 and onward... then you will want to act now. 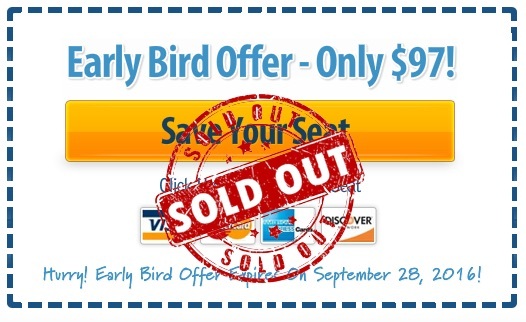 Early Bird Price: Now Only $97! For all orders received until September 28, 2016, you will receive a massive one-hundred dollars discount, for a total admission price of only ninety-seven dollars ($97). There isn't anywhere this money will be better spent than on this bus trip – giving you the best chance for creating a better future for yourself and your family. What could be more important than that? And it's easy to order! All you have to do is click on the button below, and you'll be taken to our secure checkout page. Once you're taken to the checkout page, locate and click on the green "Check Out" button. Then, fill in your information and click on the "Submit Order" button. That's it! You will receive immediate confirmation on the screen and via email, and you can start counting the seconds to a once-in-a-lifetime experience. Act now, secure the massive early-bird discount, and remember this day. Not long from now you'll be fondly looking back to this day, to this decision, knowing: "this is where it all started!" P.S. I'm not sure when's the next time we will be offering this bus trip... so this might be your last chance to be on one for quite a while. If you're on the fence about it, I strongly recommend you securing your seat now. There really is nothing better you can do, not for this price and not for 100x the price, that will have a greater impact on your knowledge, mindset, network, leverage, and chances of success. AND... If you have a friend that might be interested in joining you, let us know once you book your seat by replying to the confirmation email – and we will gladly throw in a complimentary seat for them - free of charge!